I started giving “planner tours” back in high school. Friends wanted to know why I carried it everywhere, what I wrote in it, and probably if I had any tips that would work for them. My planner has evolved over the last 25 years, and with so many people looking to integrate paper and digital tools as they manage the details of their personal and professional lives, I thought this quick tour would be helpful. This post has been created so you can skim it in two minutes or less, but I also provided some in-depth answers, in case you want more. Of course a paper planner isn’t going to be the right fit for everyone (I know plenty of people who do all of this digitally), but hopefully the ideas shared here can help you decide what will work best for you. Enjoy! I have a thing for FranklinCovey. It started when I was 13. This specific planner is a FranklinCovey Compact Size with Blooms two-pages-per-day inserts (I just keep 30 pages in there at a time so it stays slim). It doubles as a wallet—holding my driver license, credit cards, library cards, checks, stamps, Post-it notes, thank you cards, receipts, photos, etc. I can see a lot of information at a glance. It calms my brain to actually use pens and paper. Some people worry about carrying a big planner around all the time. And I get it. That’s when I would recommend the pocket-sized planner (super tiny…just like a wallet), or I would suggest you email yourself reminders or voice memos when you are out and then put that information into your planner when you get home and you are keeping your emails at zero. 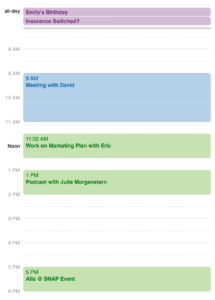 Eric and I use a shared Google Calendar to manage all our appointments and deadlines. I held on to my paper calendar as long as I could, but at the end of the day, digital calendars just make more sense for us. His appointments are in blue, mine are in green, and then I created a “Triggers” calendar in purple for things like task and birthday reminders that Eric doesn’t necessarily need to see. I check this first thing every morning and then periodically throughout the day to make sure I’m on track. Although I don’t use the two-page paper calendar included with my FranklinCovey planner, I use the Prioritized Daily Task List to record date-specific tasks that need to be checked off by the end of that day. I work on those tasks throughout the day, and before I go to bed that night, I make sure they are all finished. If they are not finished, it means I either planned too much for the day or I had unexpected things pop up. In that case, I do forward one or two things over to the next day’s calendar. ***The key is NOT to rewrite things over and over every day, so I try to just make a super short list and then get it done as quickly as possible. And see that column for your appointment schedule? Sometimes I “create my day” in that column—sketching out my appointments from my Google calendar, brainstorming when the best time would be to implement those tasks on the left, and filling in time for my nap, meals, family time, reading, exercise, etc. And then that paper on the right is my note-taking and dreaming space. I use it to outline meeting agendas, grocery lists, price quotes, ideas, and goals. David Allen’s best-selling book, Getting Things Done®, is what locked my FranklinCovey planner into place. I color-code those, and I do keep every color marker in the zipper pouch at the front of my planner. Because it makes me happy. The specific tool I use for this is the Progressive Task List insert or the FranklinCovey pouch pagefinder with the Compass Cards (turned backwards). Asana is awesome. You can upload photos, add links, set deadlines, outline full projects, and share tasks with a team. I use that strictly for LearnDoBecome. Then Evernote holds my personal Current Projects List, plus images, documents, agendas, etc. that I need for ANY of my projects—work or personal. Evernote also holds pretty much everything I would want to access from my phone or computer (besides private passwords and confidential stuff). First thing out of the gate (after my personal morning routine) is to look at my Google calendar to see what HAS to be done. Then I work from my Evernote Routines List and my paper planner task list–and fill in the gaps with Next Actions. Sitting down to work for a few hours a day is on my Routines list, so that’s when I utilize Asana and move forward on my business projects. Evernote is there to support me every step of the way. I’m usually in there at least a dozen times—creating new notes and accessing past notes. The day is fluid because my life is full of activity and I want to be able to adapt to the needs of family, friends, team members, and neighbors. But I do set boundaries to accomplish my work and take breaks (because otherwise I lose my mind). As I’m typing all of this out, I recognize there are a lot of details and moving parts here. And honestly, I’m not trying to complicate things, claim perfection, or insist that everyone needs to do things the way I do them. This is simply the process that helps me keep track of everything on my plate. And it’s colorful! And stress-free! And it kind of makes me giddy. Feel free to post additional questions or ideas in the comments (I’ll answer as many as I can), and if you’re feeling excited about revamping your system, check out the announcements below to find out how you can learn more about our productivity system here at LearnDoBecome. As a quick review…here’s a little image we put together…Thanks and happy planning!! 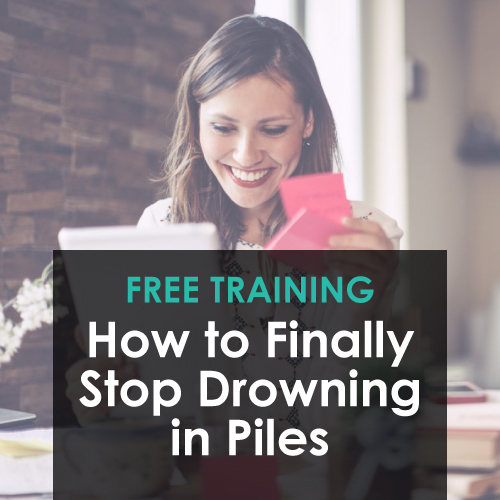 We’ve just posted new times for our live webinar, “How to Finally Stop Drowning in Piles”, and we’d love for you to attend. Want to peek into the live training series going on August 29th through September 23rd? Find out about it here! Yay!!! Thank you for this post. I was wanting to learn more about how you use your Franklin Covey planner as part of your STEP system. You’re so welcome! Glad it was helpful! 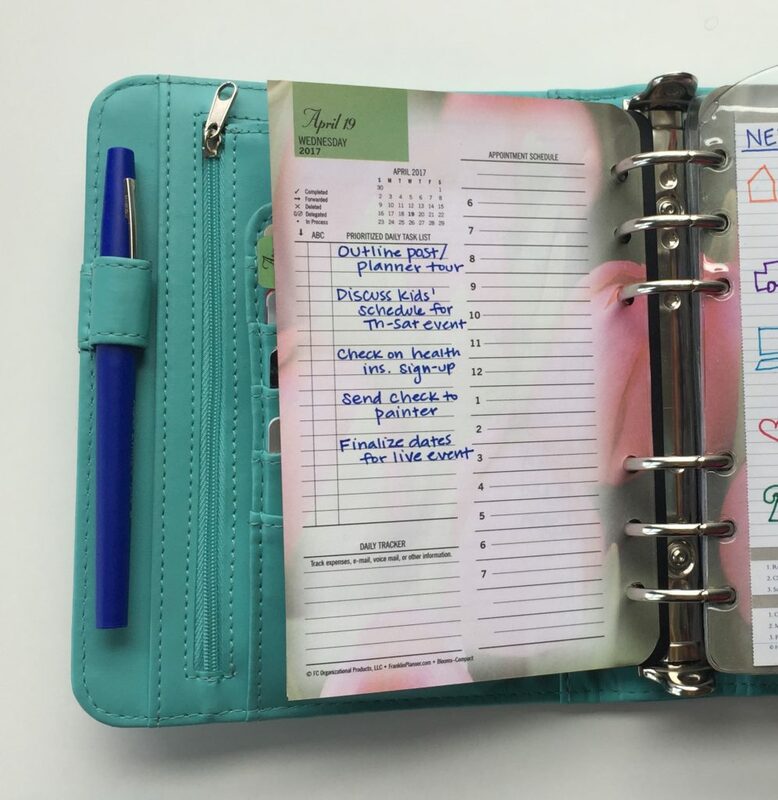 Do you use a paper planner? I also was completely addicted to my Franklin Planner starting in about 1990 and continued for many years until people insisted that I had to “get with the digital age”. My productivity has dropped steadily ever since. I totally agree that there is something cleansing (for some of us anyway) about sitting down and writing it out and I continue to do that, but not with a formal system, and now I am drowning in piles of scattered notes and lists! Brenda, I am a paper girl too. I love some aspects of digital but can relate to you in that there is something soothing and therapeutic about writing things down. 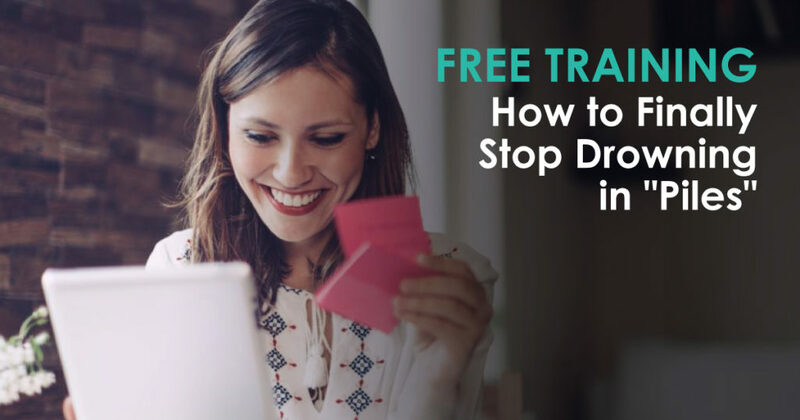 We’d love to have you join us for a free class at http://www.LearnDoBecome.com/step for helps in getting out of the piles of lists! Thanks April! 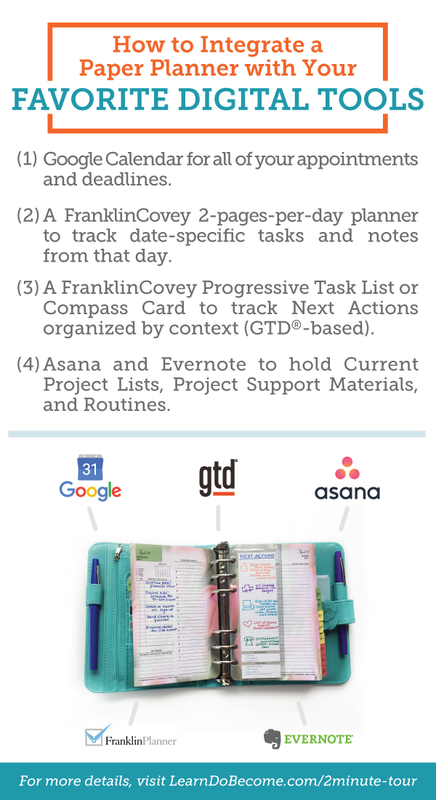 I do not get why you both use Asana and Evernote – it seems like many programs and planners to check during the day! Do you think it would work to just use one of them? I think Asana is your “WORK” and Evernote is your HOME Management go-to, right April? Don’t know Cecilie if that helps make better sense for you. I’m retired since 2013. I was totally immersed in Franklin Covey…it saved me many times. I’m considering going back to it because I love the writing aspect, too, but will give my newly adopted command central plus digital (cuz I love my laptop and smartphone, too, and see if I can’t somehow make that work. Thank you, this was helpful. One question, how did you get Google calendar to highlight appointment durations? I can only get little squares beside the appointment start times. I would to color code based on content category. I don’t see a place to change the color other than selecting a different Calendar type; 1. My Exchange calendar (green), 2. iCloud calendars – Home, Family (both in Yellow) or Work (Purple); 3. My google calendar (Blue)?? I dont see anywhere to edit colors of just certain appts…?? I think you need to do it on the computer, not on a smart phone. Thank you so much for sharing this! Everything looks so beautiful and colorful – love it! I am one of those who constantly rewrites tasks. I love your ideas for streamlining and focus. Thanks again! OH BOY!!!!! I think we came from the same mold….. I have tried to go “paperless” I need it also. Tried several different planners and need to utilize google and more into planner and don’t know how. Thank you, I will STOP trying to “re-invent the wheel”. I am a busy person, with four children, farmers wife, independent sales representative, and a local elected official. Not to mention a personal, spiritual and health life to maintain! I’m a total newbie; should I already know what a “routines list” and “task list” are? I know about “next actions list”…. that’s the “for me” for my family” and “beyond” next item grouped according to “home” “phone” discuss” “errand” and “computer”, yes? Routines are the things you usually or often need to do each day. It’s what you would like to do each day. They are a framework. You might be too busy to do all of them, but at least you can do some of your morning routine. 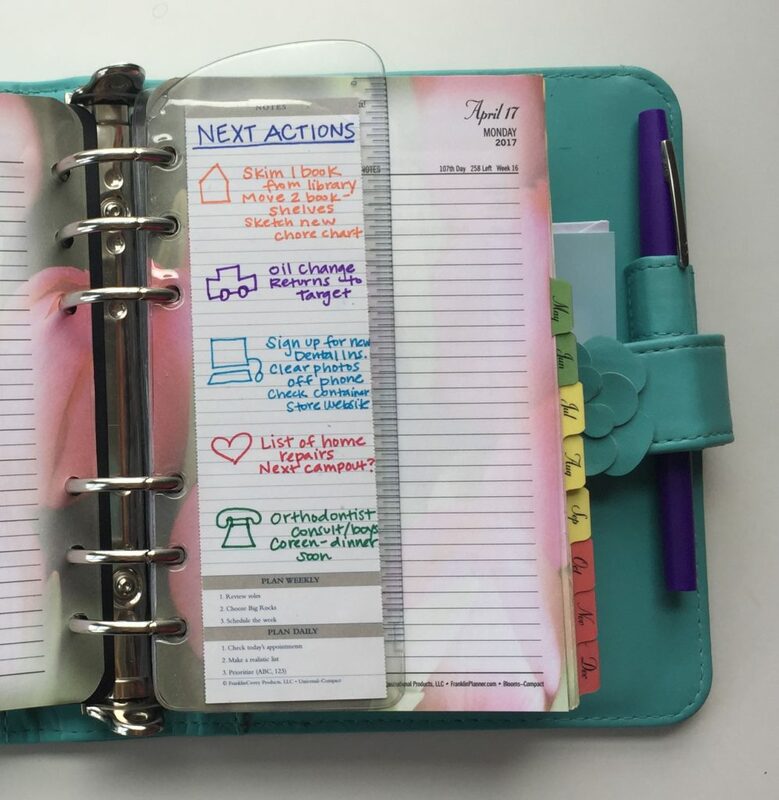 I loved my Franklin planner, but moved to mostly digital. I just use a legal pad for my task lists. I just need to develop the routine of checking my lists… OY! Where do you put all your kids sports and school activities on your Google calendar? Their schedule is what completely clutters up my Google Calendar so its visually overwhelming but it’s the best way to make sure that everyone knows where they need to be when. But now that I have two in high school plus younger ones so the Google Calendar is so over filled that we almost hate to look at it and avoid it. Any suggestions? Hi Sarah! There are two parts to this question. (1) Is it your SCHEDULE that is overwhelming? (2) Is it your CALENDAR (visually) that is overwhelming? If it’s the calendar, I would create a new color for your kids’ sports/activities, so you can turn it on/off as needed. That should help you know where YOU need to be. Then I would just put any driving responsibilities on your own calendar so you don’t double-book. If it’s the schedule that is overwhelming, the book “Essentialism” is AWESOME. Hope that helps! Thank you for creating a productivity program! I have piles everywhere at home and some at work too. I have a terrible time with time management at work and home. My work office for now is clean since I just moved in to a new space, but when the stress of deadlines hits, I feel exhausted and start to procrastinate due to being overwhelmed. How do I start making daily, productive routines at home and at work? I’ve never been able yet, to get most or all of my casework done in time each year, which leaves piles more for the next year. I read David Allen’s book, Getting Things Done. It’s wonderful but offers virtually no visual representation on how to start and maintain the routines. I have to improve because my job and family depend on me . We rarely can relax at home because everything is in chaos daily – laundry, dishes, Mail, chores and things missing or tasks forgotten. This is all due to my company downsizing staff in my department with larger work loads, death in the family this summer , other aging relatives, and more demands on our time from family. How do I start to improve? I have self-study but I am not organized naturally, I need to get ideas from people who already are very familiar with this process. We are so glad you are here! Have you been able to be part of the STEP LIVE classes? We’ll have more podcasts and tools coming soon, as well, but since you are in Self-Study, I would start with Module 1, Step 1, and if you need more support, do come into Mastery. The upgrade price would be TOTALLY worth it. We’re here to help however we can! Much love! I am wanting to buy a Franklin Covey planner and am struggling with what size to get. I do use a google calendar, but otherwise am definitely a paper/pencil kind of person. I watched your 30 min. 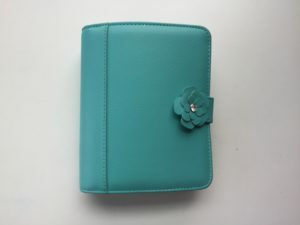 planner tour in the STEP program and was going to order the classic size because I love how you set yours up and you said you loved that size, but I noticed that you have now moved to the compact size. What made you switch? Any recommendations for me? I do like having a clear pouch for money and things and also extra space in the back to hold my routines list and other parts of the program for quick reference like you had in that tour from 2012, but it is sure tempting to have a smaller planner that will fit in my purse better. Help! I have already spent WAY too much time trying to decide! Yes!! I feel your pain! Classic is amazing. Tons of room. But I am so in love with Compact now that I don’t think I will ever go back…. it is so easy to carry around, and now that I have EVERNOTE, it solves the need for more space to write. Maybe I just need to learn Evernote! I figured only one thing at a time! First, get my command central running and going well, then learn another program like Evernote. 🙂 In the meantime, maybe I’ll still go for the compact so it fits in my purse and hopefully will be enough room! Wish they had the color of yours still though. I have looked and looked and can’t find that color or any that I like on the Franklin Covey website. I am looking on Amazon to see if I can see another binder that is the right size that would work with no luck yet. Anyway, thanks so much for all you are doing! I can’t tell you how excited I am right now!!! I can see light at the end of the tunnel. I am all caught up and ready for the Live training of Module 6 tomorrow! The Live trainings have been wonderful. Thank you!! Thanks you SO much for this post!!! I just can’t do 100% digital and I’m finally realizing it. This was so validating and helpful. I appreciate you sharing ALL the details! You are very kind to help us all with the little steps we can take in our life that make such a huge difference. Thanks again! We are so glad to have you with us Martha! Yay! So happy to hear! I tried going all digital, and I failed miserably. 🙂 Finding a system that works for YOU is key. Good luck!!! I have used the same planner for at least 15 years, has space for appointment times every day, pages where I keep business sales records, space for personal appointments and financials, etc. Apparently it has been discontinued because I cannot locate it anywhere now! I’m not against change, but I am struggling to find a planner that suits my needs for work, business and personal. I have never been attracted to the Franklin Planner for some reason. Are there other suggestions for a truly multi-purpose planner? Hi Dawn! You are not alone in looking for a customized planner that works for you. 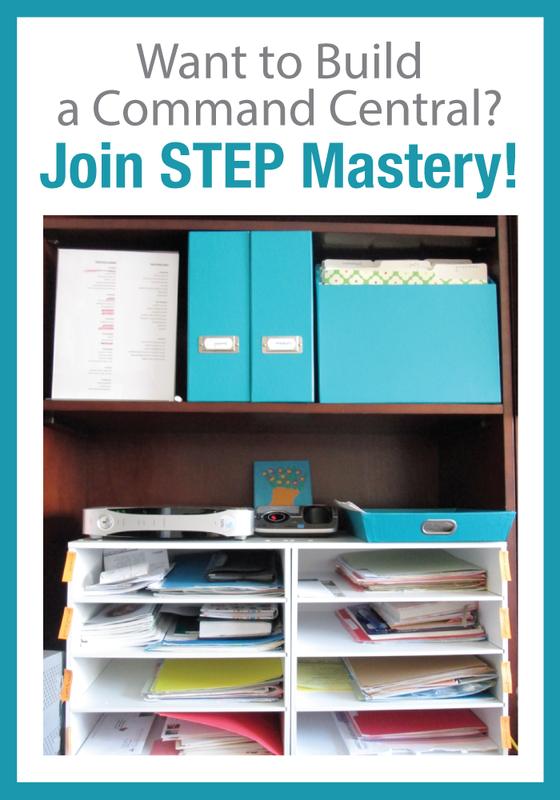 We’ve had lots of people in the STEP Mastery Facebook group share which planners they like (there are a lot, and we’ll need to do a post on the best ones soon! ), but some people make their own through Blurb–or I believe Franklin Planner lets you customize pages? I personally just use my planner for basic notes and tasks, and then I’m going digital on everything else. Have you found any digital solutions you like for your financials, etc.? I still like pen and paper. I transfer items to a spreadsheet each month but prefer recording on paper first—I make less mistakes that way. I have been looking at planners and there are so many choices that I find it a daunting task. I’ve looked at several suggested on the Facebook group page and done my own searches to no avail. I could use separate planners for work, personal and business but it would be cumbersome. I like everything in one place! I’ll keep looking…. I know I’m a little late to the game on this thread but am just discovering your website. I, too, am using Evernote and Frankin (I guess they’ve dropped the “Covey”?). I am about to dive into Asana for project management (I am into post-it notes on a laminated project planner right now.) My question is: in all of these tools, I am missing a contact management component which is very important to my business model. I currently use ACT! but can’t figure out how to integrate it into any of these programs. Any ideas? Welcome, Laurie! You will love Asana. Since this post was published, we’ve learned more and shared more about it here on our website. Jill, one of our team members, shared a video of how she uses Asana in her personal and professional life. You can find that here: https://learndobecome.com/video-optimizing-asana-using-boards-to-manage-projects/. As for ACT! I (Taryn) am not super familiar with the program but have heard good things about Zapier connecting the two. (https://zapier.com/apps/act-essentials/integrations/asana). Hopefully this is helpful! Feel free to send a message to [email protected] if you have more specific questions. Thanks for taking the time to comment here. We’re glad you found us and we wish you the very best!